You can use WDA’s materials to build disciples whether you are a pastor, a Sunday School teacher, a parent, a small group leader or a person who wants to grow as a Christian. Use WDA’s CGC (Christian Growth Checklist) to help determine where a disciple is in the growth process. Download a CGC (PDF) for use in your personal ministry. Below are several scenarios to show how you might use our disciple building materials. If you have questions and need help, please see Frequently Asked Questions or contact us for a personal response. If you do not have another Christian or group of Christians to meet with, begin by reading the Pocket Principles in Laying Foundations (Phase II). Begin with the series entitled “Knowing God.” There are 10 in that series. Be sure to think carefully about the Application Suggestions at the end of each Pocket Principle. Ask God to give you another Christian (preferably someone who is older than you are in the faith) to meet with so you can be encouraged and ask questions. Also, begin doing the Devotions. Read the Instructions and then begin with the book of John. If you have another Christian or group of Christians to meet with, join a small group of new believers and begin studying through the Small Group Studies, beginning with the “Knowing God” series. It will also be helpful for you to read the Pocket Principles in the “Knowing God” series. Being a part of the small group and building relationships with fellow believers is just as important as the information you will be learning, so attend your small group regularly. Begin doing the Devotions since meeting with God regularly will strengthen your relationship with Him. Begin with the book of John. For background and information about the disciple building process read and study: Disciple Building: A Biblical Framework and Small Groups Manual. Two other sources that would be helpful are: Disciple Building: A Practical Strategy and the Life Coaching Manual. Lesson #1 of “ Knowing God” will introduce the concept of a devotional time. Encourage group members to have a Quiet Time and to follow the schedule of reading offered in Devotions. This schedule was designed to emphasize the truths a young believer needs to know. If you want to have small group discussions, divide your class into small groups and use the Small Group Studies. For background and information about the disciple building process read and study Disciple Building: A Biblical Framework. For background and information about the disciple building process and how emotional issues affect spiritual growth read Disciple Building: A Biblical Framework. Read How Emotional Problems Develop to begin to understand the source of emotional problems and possible approaches to remedies. Help people work through The Emotion Workbook, if appropriate. For background and information about the disciple building process read and study: Disciple Building: A Biblical Framework and Disciple Building: Life Coaching. Another helpful resource is Disciple Building: A Practical Strategy. Encourage your disciple to join a small group or begin a small group yourself where the Laying Foundations Small Group lessons will be studied. The Equipping for Ministry (Phase III) resources are available to help a leader (or team of leaders) train a group of believers who are ready to learn the basics of ministry. The resources are designed for a small team that will interact around ministry themes and take action in evangelism. We strongly encourage that the Christian Growth Checklist (CGC) be administered to all participants to determine if this is the appropriate faith challenge for them. The current WDA materials are designed to be used with adults, but they can be adapted for youth. The NGP approach (explained in Disciple Building: A Practical Strategy) can be used to design individual growth projects for children. If not, become familiar with the overall strategy. (Read Disciple Building: A Biblical Framework and refer periodically to the R-CAPS Grid, R-CAPS Legend and What Jesus Did/What We Can Do for clarification.) Regardless of your involvement, become the emotional champion of disciple building in your church. Challenge any leaders who have a vision for disciple building to become Laying Foundations mentors and/or small group leaders. Be sure someone meets regularly with these leaders to pray with them and give feedback. Challenge any leaders who have a vision for disciple building to become Laying Foundations Mentors and/or small group leaders with you. Meet regularly with these Laying Foundations (Phase II) leaders and pray with them and give feedback. Be aware that these resources were not written specifically for a youth audience. Though the concepts are designed for new believers of any age, some of the illustrations may need to be adapted. Publically announce the formation of the groups and/or mentor opportunities, communicating the purpose and goals of the Laying Foundations Experience. Invite voluntary participation. Assign those interested to a group or a mentor. Use the Laying Foundations resources. 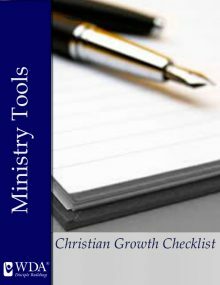 Assess all members using the Christian Growth Checklist. Encourage those who need the Laying Foundations Experience to join a small group or connect with a mentor.